Is Beta Sigma Phi non-profit? What corporation handles the complete business management of Beta Sigma Phi? Who determines when and where new chapters may be organized? A new chapter may be installed with a membership of __________________. When does the International Executive Council assign a new chapter its name? How are Ritual of Jewels chapters named? What are the degree prefixes? How does the Master prefix differ from the others? Do Ritual of Jewels chapters have a prefix? What letter prefixes precede the chapter number? What is your chapter name and number? What is the official magazine of Beta Sigma Phi? What is the purpose of The Torch? What are the 6 contests International offers to the members? How does the chapter yearbook help members? 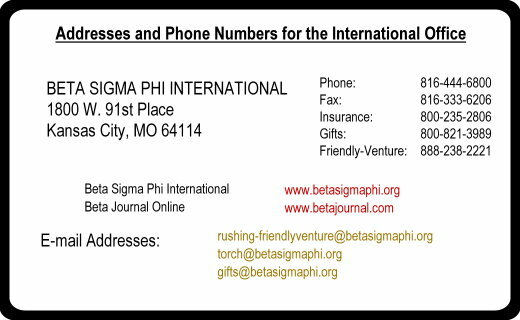 When you have a question or concern about Beta Sigma Phi, please write to your Division Chairman. On ALL correspondence to the International Office, members should include 3 things. Who may visit the International Office? Who may write to the International Office?